No-cook, no-sugar, no problem! 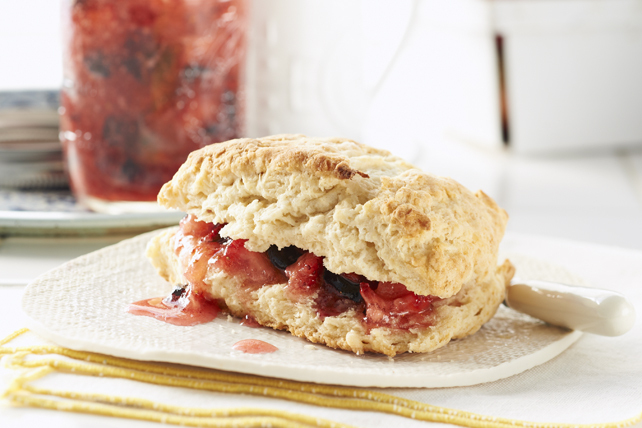 Our homemade Light Blueberry and Strawberry Spread is so good, you won't go back to store-bought jam. Crush blueberries thoroughly, one layer at a time. Measure exactly 1-1/2 cups prepared blueberries into large bowl. Hull and crush strawberries thoroughly, one layer at a time. Add exactly 1-1/2 cups prepared strawberries to blueberry mixture in bowl. Stir in lemon juice, low calorie sweetener and pectin crystals. Let stand 30 min., stirring occasionally. Fill all containers immediately to within 1/2 inch of tops. Wipe off top edges of containers; immediately cover with lids. Let stand at room temperature until set. (May take up to 24 hours.) Store in refrigerator up to 1 week or freeze extra containers up to 1 year. Thaw in refrigerator before using. This recipe will yield 3 (1-cup/250-mL) containers of spread plus a partially filled container. Refrigerate the partially filled container immediately and use within 1 week. Enjoy this no-sugar light blueberry spread that's naturally fat free.